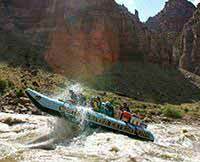 Awesome canyons, fabulous food, thrilling rapids and excellent company – all in one trip! What a thrill the Cataract Canyon was...from the amazing hummer ride up the rocks to the Cessna that flew over them - never have we had such an interesting and exciting time on the river! 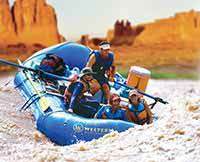 Our rafting guides pointed out lots of history along the Colorado, expertly steered us through the rapids and cooked up some great food! Mike was a very confident leader and Hailey and Desiree were fun and happy all the time, even after rowing/paddling for 15 miles over rapids. We were glad to be in Danny's boat when we hit the Class 4. They thought of everything to make our trip enjoyable...even a loo with an amazing view!